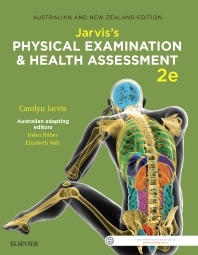 The second edition of the leading Australian text Jarvis’s Physical Examination and Health Assessment has been carefully revised and updated to reflect current skills critical to the practice of registered nurses in an Australian and New Zealand context. Jarvis’s Physical Examination and Health Assessment incorporates the most up-to-date research data, clinical practice, policies and procedures. Authors Helen Forbes and Elizabeth Watt skillfully embed prominent nursing concepts throughout including; patient-centered care, cultural and social considerations, health promotion and disease prevention, as well as the individual across the lifespan. Jarvis’s Physical Examination and Health Assessment is the ideal tool for undergraduate nursing students, registered nurses and experienced practitioners wishing to develop and refine their health assessment skills. Part of a comprehensive and revised learning package including Pocket Companion Jarvis’s Physical Examination & Health Assessment 2e and Student Laboratory Manual Jarvis’s Physical Examination & Health Assessment 2e.